I'd love to use linen, cotton, or a plant fiber on this to keep it light for summer. I also love that the tank is styled with another tank under, which is much more realistic to me than wearing just a knitted tank by itself. Whenever I see a knit tank alone, I always wonder how someone can wear it with just a bra and not feel "exposed". 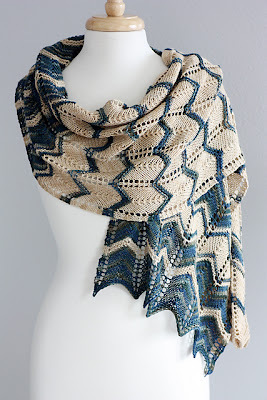 I love the drape of the cowl and the texture of the fabric on this piece. And it's possible that I'm being seduced by a great colorway and photo set. The wrap is so cute and the colors are classic and nautical. I could totally see throwing this in my purse to fight the AC in the summer. I know we've looked at chevrons before, but I love this for the irregular striping and aged look. Just an excellent combo of color and pattern.